I’m becoming infatuated with the South African novelist J. M. Coetzee. Such spartan prose! 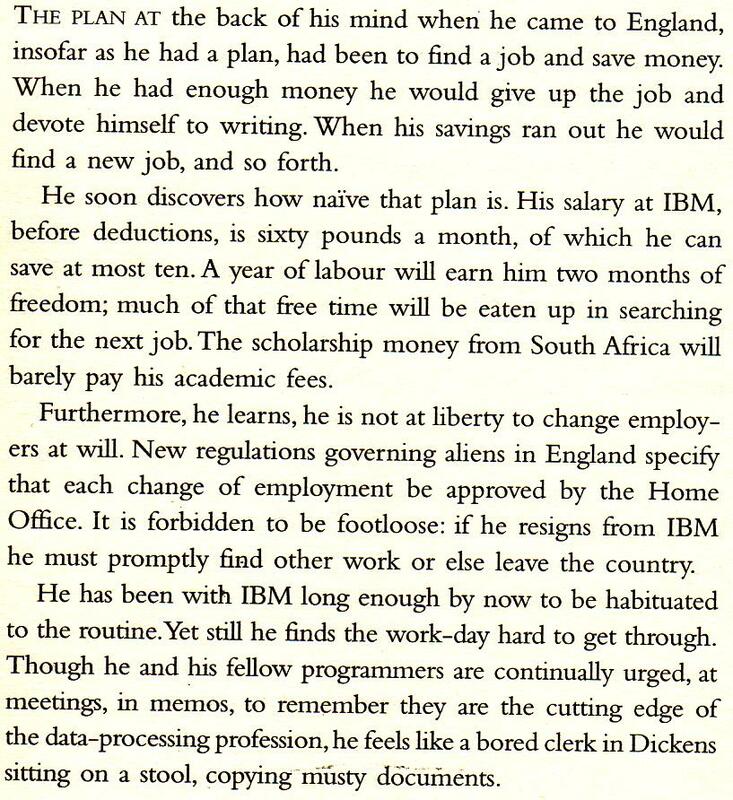 In his third-person memoir, Youth, Coetzee writes about working for IBM’s London offices in 1963. Even though he worked on the cutting edge of technology, the practice was mind-numbingly dull; much unpaid overtime was required; and when his programming skills were lent in a minor way to the Cold War effort, the job caused him to contradict his personal ethics. The digitisation of printed materials is the most relevant topic in publishing and librarianship today. Boring, I know, but there we have it. Just before he died, the great Ray Bradbury finally consented to a Kindle edition of Fahrenheit 451: a symbolic victory for eBooks if ever there was one. Even my own lovely book, published recently by Go Faster Stripe, comes with an instant PDF download when you buy the print version. Even though I dislike eBooks myself, I’m beginning to think seriously about providing a digital download version of New Escapologist. 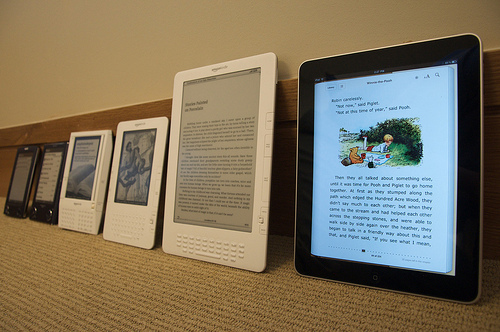 It would not replace the printed editions: it would simply be another platform from which to read them. My motivation is a combination of the two strongest forces in the universe: peer pressure, and supply and demand. We produce New Escapologist with a certain aesthetic experience in mind, and I feel this is compromised if a reader’s first exposure to the work is on a screen (likewise, I don’t intend to have the blog printed and bound at any point). Moreover, the entire ethic of New Escapologist is to live freely, which, we’ve always said, means severing dependencies upon pricey electronic gizmos. Moreover, I have a deep personal passion for books: real books. I don’t have much to say one way or another about downloadable PDFs, which means the ‘labour of love’ element of producing New Escapologist could also be compromised. There are counter-arguments to all of my reservations, of course. Many of you feel that digital downloads facilitate freedom rather than hamper it because the lack of dead tree about the person will allow one to travel light. Moreover, the provision of a PDF download doesn’t directly contravene my love of books, just as the existence of websites or fortune cookies or sky-writing airplanes don’t: there’s arguably room enough in the world for all formats to exist. – Dear Robert. Regarding your call for opinions on the digital editions, I would vote in favour of producing NE in PDF format, but in addition to the hard copy version. I like both formats but for different reasons. Hard copy is tactile and real but digital is convenient and accessible from anywhere. Perhaps you might consider subscription options that offer either or both formats: digital-only being cheaper to reflect reduced production and distribution costs, with hard copy at the current price but with complementary access to the digital edition. I’d personally favour the latter model. – Hi Robert. Just a note on digital editions. As a minimalist, what puts me off buying the NE back catalogue is having to have them physically and move them around with me when I move (which I tend to do quite a bit). I know I could read them and give them away, but I’d rather have them for re-reading so would be more likely to buy if I could put [it] on my kindle. – Hello! I stumbled upon this site via Click Clack Gorilla, and am enamored. I wanted to read the print publications as well, but I travel for work and currently live in Japan. I feel bad having things shipped all around the world to me, and then the dilemma of keeping them or passing them on once I move again. So, if there was ever a question of making the publications in PDF form, I am one vote for yes please! – Hello. I think of NE as opposed to computer screens, and more importantly big business taking over our booknesses. I will never be ‘buying’ an ebook. You can’t flick through it, pass it on, use it for something it wasn’t intended. Ebooks (unless from free online libraries, I suppose) are eroding our freedoms, not helping them! I’m surprised some of your readers are happy to only read what Apple and Amazon let them. OK, perhaps if you were to sell the ebook file directly from your own website, which I could then download and put on my own device of choice, then that would be ok-ish. But I’m still always going to be buying the paper version. Maybe you could bundle the e-version with the paper one. Anyway, personally, NE is ‘goodbye to all that’, and that includes screens, batteries, plugs, wires and multinationals. And you can’t read on the iPad in direct sunlight, which really seems wrong for NE. – I have realised, after much thought on the subject, that there is no substitute for books. eBooks do not cut it for me. I cannot get excited about a “plastic pal” such as a Kindle or a boring bit of searchable software like a PDF or a DOC. Electronic book-reading devices would certainly solve the problem of physical book ownership, but my interest in books (as I imagine yours) extends beyond the information they contain. Part of a book’s soul is not in the words but in the typography, the binding style, the size, the thickness, the choice of paper, the odour, the width of the page margins, the weird little print anomalies or type errors. Even the vandalism, marginal notes, coffee cup rings, bookplates, hand-written dedications (“For George, Christmas 1963, Nana and Gramps”) from previous owners are part of the experience for me. You know when you buy a book and there’s a publisher’s advert in the back for alien-sounding books that don’t exist anymore and cost 2p? I love that more than anything! I love books – real books – and that is something this minimalist has to live with. So there you have it. I’m really on the fence with this one, and finding it difficult to continue in my usual mode of benevolent dictatorship. If you’d like to support the life of paper and coffee cup rings, please continue to buy it. If you’d like to join the debate for or against digital editions, leave a comment in this post. Thanks to Tom for pointing me at a BBC documentary called American Nomads. It’s terrific! A journalist called Richard Grant interviews some interesting characters who’ve chosen a life on the open road. Some of these nomads are true Escapologists: people who’ve abandoned affluent lives at various points and for various reasons. There’s a man in his thirties who quit an unsatisfying Wall Street career and took to the road. And there are the ‘snowbirds’ – older people who retired and sold their houses in favour of travelling the States in luxurious mobile homes. There’s also a travelling minister, some homeless teenagers fleeing their abusive families, a few wondering nutters, travelling rodeo competitors, a young freight train-hopper, and a silver-haired mountain man called Yogi. Worth a look if you’re curious about what happens without the securities of a home and a job. It was a dizzying prospect — to imagine all that freedom, to understand how little it mattered what choice he made. He could go anywhere he wanted, he could do anything he felt like doing, and not a single person in the world would care. 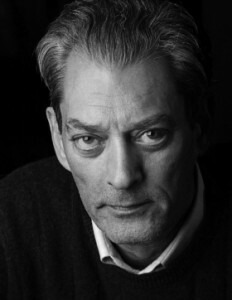 I just read The Music of Chance by Paul Auster. Just look at his serious face. It’s a tremendously liberating and satisfying novel. It’s Fight Club for grown ups. In the opening pages, the protagonist takes a wrong turn onto an American freeway and ends up heading in the direction of the wrong city. Instead of correcting his mistake, he decides to carry on. He feels giddy with freedom and is made aware of the vastness of the universe and the almost limitless possibilities we all face. He quits his job as a firefighter and goes on a wide and aimless American driving adventure. Where it takes him is properly startling. Now that he’d taken the first step, it wasn’t difficult for him to push on to the end. For the next five days, he took care of business, calling up his landlord and telling him to look for a new tenant, donating furniture to the Salvation Army, cutting off his gas and electric services, disconnecting his phone. There was a recklessness and violence to these gestures that deeply satisfied him, but nothing could match the pleasure of simply throwing things away. […] He felt like a man who had finally found the courage to put a bullet through his head — but in this case the bullet was not death, it was life, it was the explosion that triggers the birth of new worlds. Psychogeographic. Absurdist. Existential. Zen. Mischievous. Situationist.